Get the job done right, not just done. Find out how we can help. Call us at 1.518.488.4578 or request a free consultation. If you’re using Facebook Ads you already know how much of a minefield the Ads Manager can be for the uninitiated. There are a lot of powerful features that go unnoticed by even the most experienced advertisers. Facebook Ads are highly effective, and can have incredibly high click through rates, but time and again it can be hard to know exactly how to refine your ads for performance without stopping an entire campaign and starting again fresh. 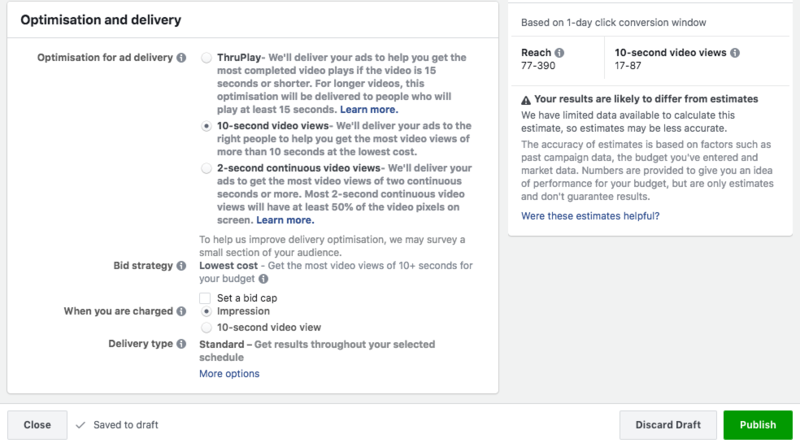 Here’s a closer look at what optimizing ad performance actually means in a Facebook Ad Account when it comes to bids, target costs, bid caps, and optimization. Let's fix your Facebook financials once and for all. Your ad wins by outbidding other advertisers with overlapping audience targeting. Win the bid, and your ad is placed. SIDE NOTE: Often, the value of the audience you’re targeting and the likelihood of them interacting with your ad can determine the value of the winning bid. Think of it this way, a yacht enthusiast audience you are trying to sell a second yacht is going to cost slightly more than a student audience to whom you're selling notepads. Yachts are more expensive, and second yachts doubly so. That's just basic math. So you've won your bid but winning the bid isn't the only thing that determines ad performance and spend. Most of your ads are also judged and perform based on their relevance score (to confuse matters if you select reach and frequency buying this score doesn't impact anything at all, but for almost everything else it does). A high relevance score can lower the cost of your ad delivery, which is what makes it so important. While it shouldn't be the only thing you use to understand if your ads are doing well it can help streamline your costs. The more relevant, and engaging, you make your ads the better they will perform. BUT we know it’s not always that simple. You can have the best, most relevant, ads in the world and still need help troubleshooting your Ad Account bidding and optimization. The most common issues we find are to do with Ad Set and Campaign set-up. When it comes to budget optimization here are a few things to look out for and adjust for better performance. These two options are fairly easy to choose between. Daily budgets are an average spend per day. With this budget, there may be some days where Facebook spends up to 25% more of your daily budget but then adjusts later budgets to ensure your total spend is not more than 100%. This means spend can and does fluctuate with ad performance. Limiting yourself to a daily budget can inadvertently stunt ad performance, especially if your ads are only running for a limited time. If you set a lifetime budget you are choosing your spend for the entire run for an Ad Set. You will not be charged more than this. For limited campaigns, lifetime budgets can really shine through. Standard spreads your spend evenly over a lifetime budget, whereas with accelerated you are allowing Facebook to spend all of your budget as soon as possible. Accelerated delivery is rarely the delivery option you want to choose but it can be useful if you have a limited time to spend a specific budget, and you've already underspent on your ads. Daily budgets are good for remarketing, and constantly-on Campaigns, this is a great long-term delivery method. Lifetime budgets are good for limited time offers or Campaigns seeking maximum exposure in a relatively short amount of time. Lowest cost bidding is the most common bid strategy that people select — and there is a reason it’s popular. It keeps your bid down to minimum cost. Your ads bid only enough to outbid the next highest bidder. If you know how much a click, conversion, or selected event is worth to you (especially if you have a fixed price service or product) you might want to combine this with a bid cap. Bid caps are exactly what they sound like — they're a set limit on bids. Facebook are also testing cost caps although these are not yet available for all accounts, which are more flexible that bid caps as these are an average of your bids. Some bids may cost more, but if they do others will cost less. If you raise a bid or cost cap, this is unlikely to make much of a difference as Facebook has it's own pacing system. If you lower a bid or cost cap, this could lead to lower performance and delivery as your Ad Sets are bidding a lower amount. However, if your Ad Sets are underspending then raising these caps could improve delivery. To change a bid cap, click on Edit when hovering over your Ad Set and scroll down to Optimization and Delivery. Under Bid Strategy, check 'Set a bid cap' and enter the bid amount. Then click Publish. What you pay for depends on your campaign type (which we'll look at in just a second). If you choose reach you pay for CPM, if you choose something like Website visits that’s CPC. Conversion goals like store visits or product sales are going to be conversions. So, your bidding strategy is how you bid and your actual bidding is what you pay for. There’s one more financial consideration (at least!) and that’s your optimization campaign. This is where I see the most conflicting strategies because you’ve likely gotten to this point and become a little overwhelmed by how many options there are. Conversions: This is often recommended by Facebook, because by optimizing for this you’ll find people who actually want to convert, and buy your product or service. Link Clicks: This method focuses on getting users to follow the link your ad provides, this is ideal to drive traffic to a landing page or Facebook page although it might not lead to conversions — often you would partner this with CPC bidding. Impressions: This method shows your ad to the maximum number of people it can, so this is appropriate for reach and brand awareness campaigns, especially if you have a limited-time offer. Daily Unique Reach: This one is often confused, but basically what this does is tell Facebook to deliver ads to the maximum number of people with a focus on only showing the ads once per day to each person. This is great for smaller audiences and for retargeting if you’re worried about high ad frequency and ad fatigue. Post Engagement: this is similar to conversions in that Facebook will deliver to the audience most likely to carry out an action but unlike conversions this is all about likes, shares, and comments — you can see how this is great for promoted posts. Brand Awareness: it’s unclear exactly how this one works but Facebook will deliver ads to those most likely to pay attention, and they may survey a selection of those people to provide you with a Brand Recall Lift score. Leads: this method partners lead generation objectives and will show your ads to those most likely to share their information and become leads. Landing Page Views: this method partners with conversion objectives and shows your ad to those most likely to click and read a landing page. Facebook typically has a learning phase for Ad Sets of around 2 weeks, during which it will learn from your ad performance. It's important that you let Ads run for a period of time before you start optimizing your ads for better delivery even if it's not necessarily 2 weeks (although I would recommend it if possible). If you don't let them run there's no way to know how they're performing. The real key to optimization is testing methods incrementally and making data-driven decisions based on the results. The gains for this compound as you continue to adjust and improve. If you're stumped on your ad performance and need a second opinion, our team have over 100 years of combined experience in digital marketing and social media marketing. Contact us today for a free consultation. Amy Hayward is an Inbound Marketing Specialist with certifications in HubSpot Inbound Marketing, HubSpot Email Marketing, and Google AdWords.